This Race to Lead report reveals that women of color encounter systemic obstacles to their advancement over and above the barriers faced by white women and men of color. Education and training are not the solution—women of color with high levels of education are more likely to be in administrative roles and are more likely to report frustrations about inadequate and inequitable salaries. BMP’s call to action focuses on systems change, organizational change, and individual support for women of color in the sector. While the directed-network campaigning model delegates the management of some important activities to its base, central leadership typically owns certain things like issue framing and storytelling that are critical to campaign success. Rapidly self-propagating protest actions like Occupy Wall Street, for example, have demonstrated that a compelling approach to a shared social pain-point can give a movement a life of its own. Momentum is committed to teaching and learning the craft of popular movements fighting for justice. We give grassroots organizers the tools to build massive, decentralized social movements that aim to shift the terrain under policymakers’ feet. We live in a time of severe inequality, racial disparity, and concentrated wealth in the United States. We need transformational change, and we believe it won’t come from within the political system. We need big movements, and we need leaders with the skills to shift public opinion and organize people at scale. Momentum is committed to supporting these leaders with a whole new organizing model, with the tools that will win profound structural and cultural change. Board games have a history in social justice movements. Even Monopoly was originally created to teach players about inequality and the problems capitalism can create. A new game, inspired by those roots, is designed to let players practice building a social movement. Swarm is Anyi’s program on decentralized organization which asks the question: how do we engage thousands more people in our organizations? What Anyi have learned from a diverse range of contexts and disciplines (including biology, complex systems, network theory, and open-source software) is that groups need structures that maximize members’ autonomy and unity. What makes some of today’s most successful advocacy campaigns work, while so many others fail to make an impact? The Networked Change Report maps out the strategies and practices that made 47 of today’s most successful advocacy campaigns work. These campaigns achieved success because of their ability to open up to the new cultural forces which favor openness and grassroots power, but also because they framed and strategically directed this power towards concrete policy outcomes. In short, these “directed network campaigns” married old power with new. 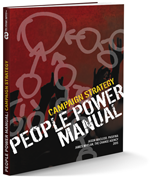 This manual is designed to aid your work as an organiser: building campaigns that enlist grassroots power to achieve outcomes that improve the world. Our objective is to lay out key ideas and practices that, in our experience, result in campaigns that succeed. This includes fundamentals of building relationships, analyzing power, and writing campaign plans. We also dig into some detail on topics such as how to enter a community, enlisting volunteers and cultivating their leadership skills, connecting your campaign to a larger movement, and how to learn from success and failure to improve your skills and campaigns. Changing society isn't a matter of breaking windows. It is a process of developing consciousness and vehicles of organisation and movement, and of then applying these to win gains that benefit deserving constituencies and create conditions for still further victories leading to permanent institutional change. Cultivating movement coherence, trust and solidarity - not just a small affinity group but far more widely - is a big part of this agenda.